Each year, NCHS releases a report to Congress and to the President concerning the nation’s health. This report is available to the media and the public, and the 33rd edition, Health United States, 2009, can be found at www.cdc.gov/nchs/hus.htm. 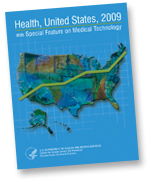 Each year the report features a special section, and this year’s focus is the growing use of medical technology. For the report’s press release, visit www.cdc.gov/nchs/pressroom/10newreleases/hus09.htm. For a podcast with one of the report’s authors, visit www.cdc.gov/nchs/pressroom/STATCASTS/statcasts.htm#statcast_16. For a brief summary of this report, visit www.cdc.gov/nchs/data/hus/hus09_InBrief.pdf. This entry was posted on Thursday, February 18th, 2010 at 9:46 am and is filed under 1. You can follow any responses to this entry through the RSS 2.0 feed. You can leave a response, or trackback from your own site.